How a typical Irish emigrant rose to a position of influence at the highest levels of US and Irish politics. A remarkable firsthand account of an Irish emigrant who began as a part-time footballer and house-painter and became a journalist, author, founder and publisher of two newspapers, a magazine and website, as well as a leading advocate for immigration reform for the 'illegal' Irish in the United States. He played a pivotal role in the Northern Ireland peace process, securing a US visa for Gerry Adams in 1994 and acting as intermediary between the White House and Sinn Féin during a critical time in the peace negotiations. The courageous and brave Irishman, Niall O'Dowd, went to the United States in the 1970s, with only a few bucks, a four-month work visa and a lot of dreams. He never could have foreseen what was to come. O’Dowd is the founder of the weekly newspaper Irish Voice, the magazine Irish America and now the website IrishCentral.com. “The Internet and the Irish Diaspora were made for each other because it's very easy for me now to reach the guy in Kansas City or the guy in California who I couldn't to through get my newspaper,” he said. 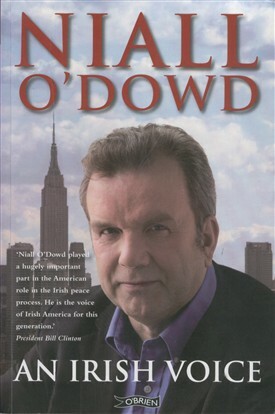 Having emmigrated to America and following a decade in San Francisco, O'Dowd moved to New York in the mid - 1980s, where he would eventually become a leading voice in the Irish community; work with powerful public officials, and contribute to the peace process that changed his native Ireland and Northern Ireland. O'Dowd was one of seven children, is married and has a young daughter. He speaks in quiet but passionate tones about his work and his role in New York's Irish community. But, he is most animated when talking about his horses. He is co-owner of two horses that race back in Ireland. “They win the Irish Derby every year. It's the easiest money in the world,” he said. “No, they won't come over here. They’re undocumented.” Perhaps we will see him at the Ballinrobe races on Tuesday next! O'Dowd has become an American citizen. He says that everything good that has happened to him, happened because of America's can-do spirit. "I wanted to leave behind the insularity of Ireland,” said O’Dowd. “You know, Alexander Tennyson said, ‘we are part of all that we have met.’ And that's what I wanted to be in America: a part of everything I met there. And California, Chicago, New York, the peace process, any of these things were just part of the journey. And I think that's really what I wanted to do, is undertake that journey on my own." This page was added by Averil Staunton on 23/06/2012.